Tax filing season is still a long way off, but scammers seem to use the Internal Revenue Service (IRS) in their schemes all year round. The IRS says it's received reports from across the country of a new scam using old weapons – threats and intimidation. Specifically, a caller claims to be from the tax agency and says the IRS has already sent you two certified letters, demanding payment of an unpaid tax bill. If you don't pay immediately using a prepaid debit card, you are told, you will be arrested. Luckily for you, the caller can take the money electronically, sparing you the embarrassment of going to the slammer. The scam makes use of the IRS' Electronic Federal Tax Payment System (EFTPS). EFTPS is an automated system allowing you to pay taxes online or by phone using the EFTPS Voice Response System. It's a free service and does not require the purchase of a prepaid debit card. EFTPS is an automated system so taxpayers would not get a call from the IRS. Also, as a taxpayer you have a number of options to pay a legitimate tax bill and are not required to use a specific one. There are several things that the scammers do that the IRS never does. For example, the agency will never call and demand immediate payment using a prepaid debit card, gift card or wire transfer. What do all these methods of payment have in common? Once you make the payment, there's no way to trace the money or get it back. All real tax payments should be made to the U.S. Treasury, never to a third party. The IRS also does not threaten people with immediate arrest. Finally – and this is a key point – the IRS never demands an immediate payment. In legitimate cases, it may inform you that it has determined you owe additional tax. However, in these cases you always have the right to appeal. 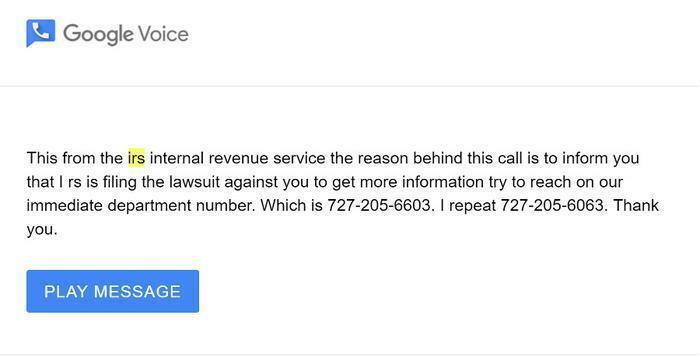 So anyone who claims to be from the IRS and demands immediate payment or else is just trying to scam you.